He/Her Collage by Rick, originally uploaded by bbmarie. This morning was collage time. Clipping, searching, pasting, cutting. Trying this, then that. I felt tired afterwards but a good tired. Our new friends Kelly and Jay Allen were over this week and Kelly brought some of here beautiful paintings on paper to show us. She creates a collage and them makes a painting of it in a very meticulous way using tiny little brushes and gouache paint. 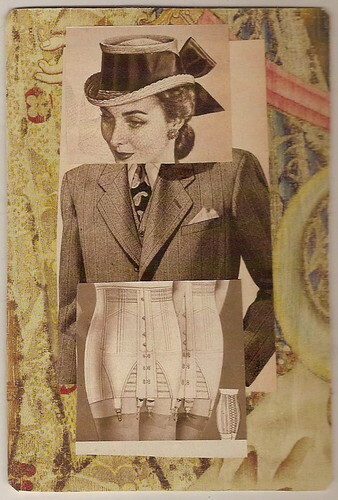 Having her here showing her work and talking about it inspired me to make more collage pieces. Artists inspire each other. It is important for us to get together and show our work in an informal way, sharing ideas and struggles. Why don't we do this more often? Hey artists out there, come over with your work that is portable and show me what you are doing and I'll share my secrets.